Every once in a while, someone special comes into your life and amazes you with their perseverance and dedication. For many in the Western New York area, Colette (Reed) Pirinelli is that special someone. Colette is a licensed occupational therapist and works with students in Niagara Country. She is the mother of two young boys named Nicholas and Jack and greets every person she meets with a smile. Unfortunately for Colette, she also endures unimaginable pain on a daily basis. In 2009, she was diagnosed with Stage III-C Recurrent Ovarian Cancer. She has since undergone chemotherapy, several surgeries, and countless hospitalizations. Still, she manages to work and care for her family in spite of the pain. This truly one of those times when the Western New York community needs to come together to support one of their own. The Call for All Angels Committee is organizing a benefit for Colette on Saturday, June 25th, 2011. The benefit will take place at The Chicken Coop VFW Post at 299 Leydecker Rd, West Seneca, from 3:00 until 9:00 pm. The proceeds from the event will go towards Colette’s medical costs. Donations are welcome and can be sent to Linda Reed, 75 Louise Drive, Cheektowaga, 14227. If you are free this Saturday afternoon, we highly encourage you to head out to this benefit. It really is for a worthy cause and we are sure you’ll enjoy yourself while there. The Tonawanda Castle’s chef, Rich, is making 200 pounds of pulled pork for the event. Other contributors from the area include Niagara Chocolates, Niagara Parks, and Page’s Paradise Island. There will be theme auctions, refreshments, and even a special auction of a signed Goo Goo Dolls Guitar! For more information, check out the Call for all Angels website. See you there! The Tonawanda Castle is proud to host this important fund-raising event on Sunday, May 15th! Sunday is the perfect day to lie around in your pajamas… or you could consider being a little more fashion forward and coming out to support Haven House at the Child and Family Services Fashion Show! The event begins at 11:00 am and will last until about 2:30. Guests will get to see some trendy looks during the fashion show and then enjoy some delectable desserts and brunch items made by the Castle’s very own chef! The event is appropriate for children ages ten and older. Haven House of Buffalo works hard to promote domestic peace and provides services to victims of violence and abuse. The Tonawanda Castle is proud to be a part of such an important event. Come on out and help us support this valuable organization! 400+ People Attend 2010 Halloween Ball Benefiting Relay for Life! Thank you, thank you, THANK YOU to the more than 400 amazingly costumed individuals who attended last night’s Halloween Ball benefiting Relay for Life. And a special thank you goes out to Linda & Tom Davide, the planning committee and everyone else who helped make last night possible. The costumes were unbelievably creative! Interested in Throwing a Ball? In 1897 a ball was thrown in honor of opening the new armory. Newspapers raved “Never before have the Twin cities had such a social function.” The grand ballroom was exquisitely decorated, the waltzes began at 10 o’clock, and the guests continued dancing until 3 o’clock in the morning. It truly was an extravagant event for the entire community. The story of the Tonawanda Ball got us wondering… parties used to be filled with elegant dresses and ballroom dancing, why doesn’t anyone throw these fantastic events anymore? 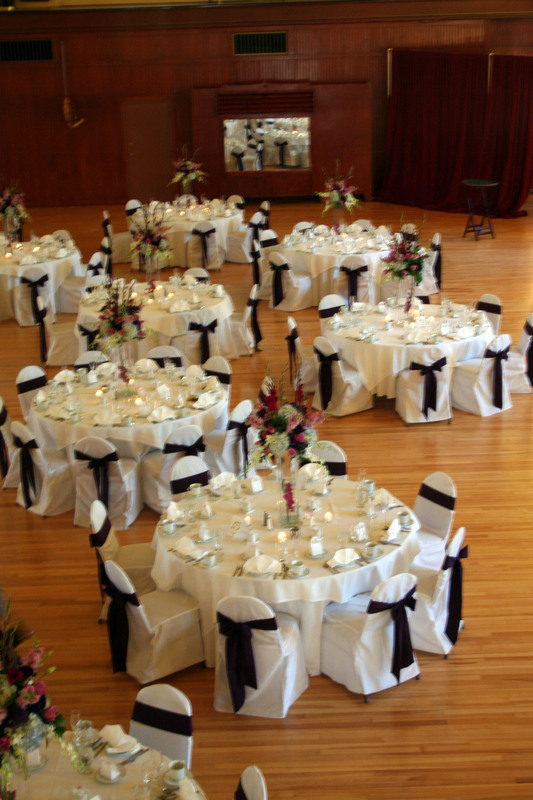 Well, after years of extensive restorations, the Grand Ballroom is ready for such lavish affairs once again. The possibilities for themed balls are endless. There could be Christmas balls, Charity balls, Sweet Sixteen Birthday balls, and even a Tonawanda fireman’s ball! Let’s bring elegance and history back into our community! The Tonawanda Castle’s tower is a majestic feat of construction. Rising to a height of more than 100 feet, it still reigns over Delaware Street with unmistakable distinction 113 years later. Already chronicled in the Buffalo News (http://www.buffalonews.com/cityregion/story/870868.html), Alice Weber told us how, as a 15 year old girl during WWII, she and a girlfriend climbed to the top of the tower to record the planes that passed overhead. But one story that seemed to keep popping up at different events was about Guardsmen that repelled down our turret in the 1970s. Stop and think about it for a second…pretty cool, huh? We really wanted a picture, concrete proof. And thanks to our friends at the Historical Society of the Tonawandas who, on occasion, drop off copies of newspaper articles relating to the Castle – we have one! 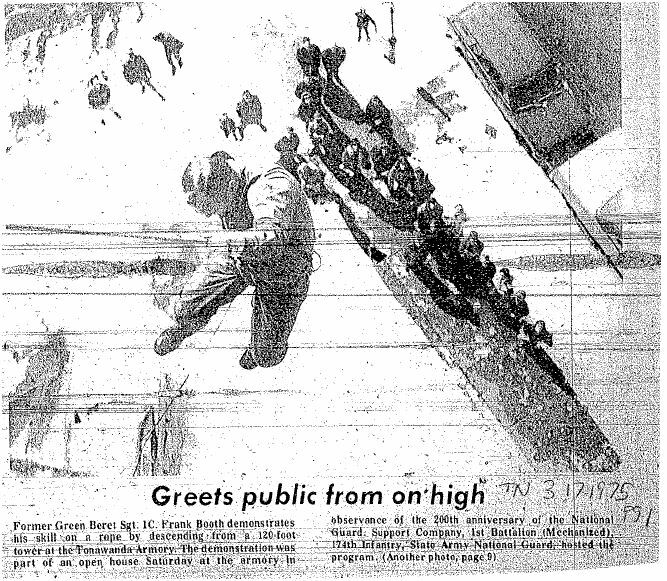 A photo from the Tonawanda News in 1975 of repelling down the turret during an anniversary celebration. Summertime is upon us! The weather is getting warmer, the trees are green and Western New York’s summer festival schedules are out. We’ve got everything – food (of course, it’s Buffalo), arts and crafts, theater, music etc…and the Castle is hosting two new and very cool events this summer. More info about T-NT summer events is available at http://www.the-tonawandas.com and keep checking our website (www.tonawandacastle.com) for new event listings! Remember our New Year’s Resolution number 3? 3. You’ll recall the Day of Memories event we held on Nov. 22nd for a documentary on the Castle? Well, now we’re in process of finishing up filming, script writing, editing etc. Basically putting together all the information we’ve accumulated in the past decade or so. Our resolution – Complete the Castle’s first documentary by mid February and screen it (but in the name of all giant projects – the deadline is flexible (wink, wink)). Well, I’m proud to unveil the Tonawanda Castle’s MINI-DOCUMENTARY. This 12 minute film focuses on the building’s history and the renovation process. Enjoy!